The purpose of the Transformer Vacuum Drying is to remove the moisture in the transformer insulation material, increase its insulation resistance, and increase its flash overvoltage. Transformers with voltages above 3kV must do vacuum drying. The transformer body is mainly composed of iron core and coil and insulating material assembly. 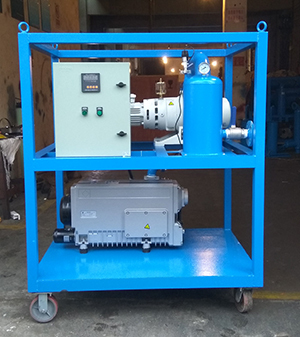 After assembly, before the transformer oil is added, it must be subjected to a drying process to remove the moisture and gas in the insulating material so that the moisture content is controlled in the product quality requirements. Within the limits to ensure that the transformer has sufficient dielectric strength and operating life. For high voltage transformers, the moisture content of the insulating material is required to be within 0.5%. 1. transformer insulation oil does not contain water. The breakdown voltage of the oil is not less than 75% of the factory data. 2. The insulation resistance is not less than 70% of the factory data. 3. The dielectric loss tangent is not more than 130% of the factory data. This kind of drying method uses air as the heat carrier medium and gradually warms up the transformer body or winding to about 105°C under atmospheric pressure before it starts vacuuming. Due to slow heat transfer, uneven internal and external heating (internal cooling and external heat), high-voltage and large-capacity transformers have a thick insulation layer, and often need to be preheated for more than 100 hours. The production cycle is very long and the drying is not complete. It is difficult to meet the transformer insulation requirements. However, the equipment is simple and easy to operate. (1) Regardless of the method used to heat and dry the transformer, the temperature of the transformer body must not exceed 95°C when there is no oil, and the oil temperature must not exceed 80°C when the oil is dry, to avoid oil aging. If oil resistance does not increase the insulation resistance, the oil should be completely drained and dry without oil. (2) The insulation resistance and the breakdown voltage of the oil shall be measured every 4 hours using the oil drying method. When the oil breakdown voltage is in a stable state and the insulation resistance value is also stable for 6 hours, drying can be stopped. At the beginning of the drying low temperature stage, it is not suitable to vacuum or dry under low vacuum conditions, otherwise it is not conducive to the rise of the core temperature and the elimination of moisture. When the temperature rises to 70-80°C, the vacuum degree starts to increase. Drying for 1 to 2 hours, the water vapor in the tank is more, the heat radiation capacity is improved, the internal temperature becomes uniform, the moisture is gradually reduced, and the heat radiation ability is reduced. After drying by Vacuum Pump Machine, a thorough identification of transformers insulation properties is required to check its drying effect. The items identified were the same as the test items for the overhaul of the heart except the casing.